Hanoi (VNA) – Velvet antler products produced in Huong Son district, the central province of Ha Tinh, have earned the Huong Son geographical indication (GI) protection on the national scale. Products covered by the protection include fresh and frozen velvet antlers which weigh at least 400g a pair, and dried velvet antlers. The GI protection is the result of a project implemented by the provincial People’s Committee since December 2017. Velvet antlers taken from stags raised in Huong Son have higher content of nutrients compared to those in other areas, which is attributable to the deer’s food, mostly plants growing naturally in the district. 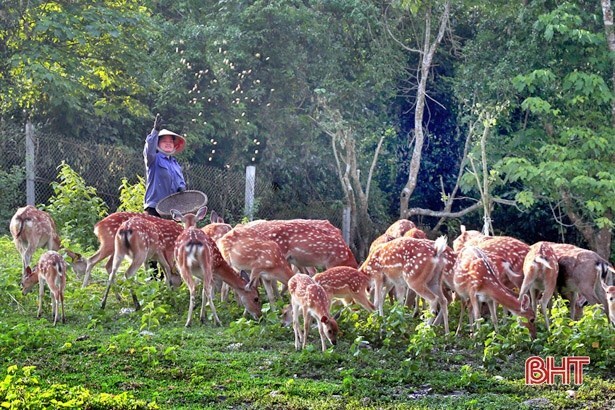 At present stags are raised in all 32 communes and towns in Huong Son district, numbering more than 35,000 heads. Velvet antler refers to the whole cartilaginous antler in a pre-calcified stage. It has been used for a wide range of purposes, from restorative tonics to treating impotence. Farmers only need to clip the antlers of the deer they raise on their farms, there is no need to slaughter the animals. Antlers grow and re-grow very fast and in several weeks, as they reach their final size, the cartilage within them gradually converts into bone.